NHS: East of I-95 into Aberdeen Proving Ground. MD 23 · Jarrettsville Rd., Norrisville Rd. Status: Marked north-south west of MD 165, east-west between 165 and US 1. A new MD 23 was opened in 1965 from US 1 west to MD 165, 2-lane and partial limited access. Originally this was intended to be the Piedmont Expressway, a part of an outer belt for Baltimore, extending west into and across Baltimore County, crossing I-83 just south of MD 137, ending somewhere near Westminster, at an intended enhanced bypass for that town. I'm unsure if it was intended to carry MD 23 across the entirety of the Piedmont. It was a pipe-dream folly that never got a definitive alignment hammered down on a large scale map. Per an agreement signed in December 1959, transfer was to only occur after completion west to MD 146, but the part west of 165 was mothballed, so that existing part was transferred into the system. The swap from old to new 23 occurred January 7, 1965 per SRC records. The old 23 never had any other number afterward, though I sometimes catch myself calling it 923. Unlike many old routes, or parts thereof which remain in the state system for years, even decades as a higher number before being dropped, Jarrettsville Road was transferred directly back to Harford County maintenance. Officially there's still a 1.28 mile break in the route along 165 between the old and new 23; it's not dual-signed with 165, only "TO MD 23". 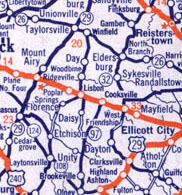 In 2000, Route 23 was extended by 0.22 mile on its east end to connect with the new Hickory Bypass (US 1). All the suffixed sections were stubs associated with the old junction with US 1 in Hickory, and have since been downloaded to county maintenance. After the extension, mile markers were added from US 1 out to MD 165. Mileages increase westbound along this portion, but in the route as a whole, it's northbound. A circle was added in the late 2000s at Commerce Dr in Forest Hill between MD 24 and Business US 1. MD 23A: 0.34 mi. ; East-West Hwy. ramp onto Bel Air Bypass. Was actually part of southbound US 1. MD 23A: Water Tower Way 0.15 mi. ; From MD 23 south to US 1. MD 23B: Granary Rd 0.16 mi. ; From MD 23A east to US 1 BU. NHS: Between I-95 and US 1, plus US 1 concurrency. Truck Restrictions: Unknown, but bridge at Rocks State Park has clearance of 14'-7", truck travel not recommended between MD 23 and MD 165. MD 24 is a dichotomy of two different roads in the space of its 25 mile run. One south of Bel Air, with NHS status, 4-lanes and heavy traffic. The other north of US 1, a more secondary two-lane road, winding its way through Rocks State Park, best served by other, straighter routes like 23, 165 and 543. The main commuting route for the rapidly developed suburban corridor between I-95 and Bel Air, MD 24 was built as a 4-6 lane divided highway with access controls, opening November 9, 1987, replacing the old 2-lane Emmorton Road which became MD 924. After intersecting Business US 1 (the spot where every retail/restaurant chain known to man seems to have a location within 1/4 mile), it then runs concurrently with US 1 (Bel Air Bypass) to an interchange that marks the northern end of 924 north of town. Between US 1 and Forest Hill, there is more extensive retail and residential development; MD 24 has been widened to 3 lanes and several traffic signals added. North of MD 23 in Forest Hill, 24 is two lanes and quite curvy at that, especially through Rocks State Park. (speed limit is 25 mph through the park.) After the park there is a circle at MD 165, leading to the Pennsylvania border town of Fawn Grove. MD 24 changes to PA 2055, a small spur off PA 851. Somewhat confusing since MD 23 turns into PA 24 less than ten miles to the west. MD 24 originally would have ended at old 23 (Jarrettsville Pike) until the mid 1930s. The portions of Emmorton Road in state maintenance from MD 7 (then still US 40) north to US 1 was designated MD 153. South of current MD 7, the role of current 24 was served by the current 755, then designated MD 408. It would have been a staggered intersection to the west. MD 24D: 0.23 mi. ; Enhances access between 24 and US 40, where before only access was via MD 755. MD 25 · Falls Rd. Parallels the Jones Falls through Baltimore, thus the name. It's the main spine for Baltimore's Hampden neighborhood, the detour for the JFX, and little else. South of Hampden and the connection with I-83 Exit 8, it's so deep in the valley it connects with little else until reaching its southern terminus near Baltimore's Penn Station. This stretch is home to the Baltimore Streetcar Museum, and some old rail alignments. Leaving Baltimore City, for a primary set (2-37) numbered route, MD 25 doesn't go anywhere in particular. Doesn't connect with another county seat (the original mission of the primaries), unless you count a side-swipe of Towson via West Joppa Road. MD 25 runs through the horse country of northwestern Baltimore County, between I-83 in the east and 140 on the west, that has been protected from growth from Brooklandville (MD 130-131) out. It connects with some county roads that serve as connectors to I-83 (Padonia Rd, Shawan Rd, Belfast Rd) with MD 128, 88 and 137 leading west. There is no single east-west route across this area. As a 2-lane road with lane width on par with MD 45's upper reaches, MD 25 is a commuter artery that hasn't lost its scenic aspects. If you're into hills, twists and turns, without the narrow lanes that normally go with them, Falls Road offers a quality ride. State maintenance ends at Beckleysville Road in an area referred to as Armacost, basically the nether world between Hampstead and Hereford; in Baltimore County with the latter, but sharing a zip code with the former. The Falls Road name continues on into Carroll County, but quickly peters out into a gravel road near Alesia. So named because the road traverses Parrs Ridge, the backbone of the Piedmont Plateau between the Chesapeake coast and Catoctin Mountain. At an elevation between 800-1100 feet, it's the highest feature east of the mountains in Maryland. Eastward it's all downhill to the Bay; to the west runs down to the Monocacy River drainage basin in Frederick County, most of which is traversed by US 15. 25.17 mi. in Maryland; from Georgia Ave. north to MD 99 northwest of Ellicott City. US 29 has its own page in the US highway section. old number for MD 27. Status: No longer assigned, became MD 27 in 1934. MD 29 swapped numbers with 27 when the latter became the new US 29 in 1934. 1934, the year of two 29s. MD 29 (left) changes to 27 the following year, as US 29 bottom right, enters Maryland along the former MD 27. 19.16 mi. ; from MD 140 in Reisterstown north to PA line. NHS: Entire length except small piece between I-795 & MD 140. A very important route in the state highway grid, a mostly straight shot providing access to Hanover and points north, particularly Carlisle. I had avoided this route for quite some time, despite some of the former routes in the area that come off of it (89, 90, 833). The backups in Hampstead/Manchester are legendary, making MD 30 a route to somehow get across east-west than to travel along. A certain amount of congestion here is considered 'baseline', and not even mentioned on traffic reports, much like Towson. Apart from a few spots along the new Hampstead Bypass portion (the approaches to the circles), it is a two-laner, but important enough to warrant NHS status. The Hampstead Bypass has been on the drawing board at least since 1970, but languished, especially being in a majority Republican county in an overall Democratic dominated state. Only with the election of Republican Governor Ehrlich in 2003 did the ball really get rolling, construction beginning in 2006. 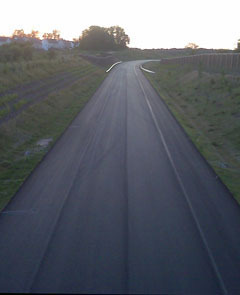 As of July 2009, my first trip along 30 since September 2001, the Hampstead Bypass was almost completed, it is be 2 lane with circles for access. The bypass was opened to traffic on August 6, 2009. I only fear that the backups will simply shift and become worse in Manchester and the areas just north of the end of the bypass. A Walmart, plus several other shopping centers sit there. It's an odd junction, shoehorned in next to a junkyard. After consulting the HLR, the mileages on the right are once again official; the bypass lengthens MD 30 by 0.47 miles. However, the circles serving as connector points are not noted, so this may vary yet again, depending on final totals in next year's HLR. As an aside, the news of the groundbreaking might have broke about the same time as MD 43 opened down my way (October 2006), because I somehow completely missed it. Given that, plus the semi-siesta I was in about updates, I could just as well have been on Mars. So imagine my surprise when reports casually start mentioning it opening 'this summer.' Especially since I had said on another page here, 'don't hold your breath,' because of the political situation. I made up for lost time, and managed to get plenty of photos of the construction in the months leading up to the opening. Unless something happens with a Manchester bypass (as far as I know, it's dead in the water, but I've been wrong before), I won't need to return for photos until sometime around the year 2250. 4.23 mi. ; loop east off Hampstead Bypass. 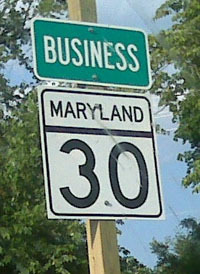 After the opening of the Hampstead Bypass, Main Street will be designated Business MD 30. I thought that it could end up possibly being MD 668 (30's associated hidden number). The same proviso for the mileages applies as for main MD 30 above. In town, the business designation hasn't yet been added on any markers. Now that main line traffic is off Main Street, a long-awaited streetscape project may be in the works, similar to the one currently underway in Taneytown. This depends, of course, on the economic situation, and the plans may be put on the shelf. MD 31 · New Windsor Rd. Route 31 once ran west of its current end in Libertytown all the way to Frederick before it was switched to MD 26. On the other end MD 27 northeast of Westminster, along with a small piece to the northeast of Manchester was once part of 31. Status: Marked north-south from Westminster to MD 108, east-west south of MD 108 to I-97. NHS: Between I-97 and I-70. Now a freeway for a significant part of its length, MD 32 has seen more than its share of changes over the years. Route 32 began as a highway northwest off US 140 in Westminster west to Taneytown and Emmitsburg. To the south, 32 was extended south down to current MD 144, later all the way south to US 1, over a southern section once designated MD 106. All this before World War II. The original section was bypassed by MD 97 in the sixties, later MD 140. The northern terminus of 32 was rolled back to Westminster, and the old section numbered MD 832 (mileage was then 54.30 mi). A further rollback occurred sometime after 2000 when a streetscaped Main Street was transferred to local maintenance; now the northern end of 32 is at Westminster's southern limit. If Carroll County needs lane-miles elsewhere, 32 could be truncated once again, probably down 3 miles to the parallel MD 97 south of Carroll Community College. If the route doesn't reach Main Street, what would be the point of leaving it there? On the southern end, the Patuxent Freeway was completed from US 1 south to MD 170 by the late eighties, and north of US 1 to US 29 upgraded in stages in the early 1990s. The full freeway north to MD 108 in Clarksville was finished by 1996, with the exception of traffic lights near NSA just east of the B-W Parkway. These lights, the last on MD 32, were all removed by 2004. Exit numbers and configuration of the junctions in this area were completed by 2008. (Thanks to David Grabiner for these updates) Exits 9 and 10A are restricted areas near the headquarters of the National Security Agency (NSA). In this area is a section of US Government maintenance. Sections of MD 32: AA-AK are all in the Odenton area. MD 32A: (no name) (CR) 0.16 mi. ; from MD 32 west to MD 851. MD 32B: (no name) (HO) 0.02 mi. ; between MD 32 and MD 851H. MD 32AA: Sappington Station Rd. (AA) 1.00 mi. ; from MD 32 north to MD 677. MD 32AB: Burns Crossing Rd. (AA) 0.13 mi. ; from MD 32AA north to Dicus Mill Rd. MD 32AC: Burns Crossing Rd. (AA) 0.40 mi. ; from MD 32AA south to end of state maintenance. MD 32AD: Sappington Dr. (AA) 0.06 mi. ; small section under SHA maint. MD 32AE: Dicus Mill Rd. (AA) 0.15 mi. ; from MD 32AB east to end of state maintenance. MD 32AF: Gambrills Rd. (AA) 0.32 mi. ; connects 32AI, AH, and AJ. MD 32AG: Tobin Way (AA) 0.16 mi. ; from MD 32AF west to cul-de-sac. MD 32AH: Lodigani Ave. (AA) 0.4 mi. ; from MD 32AF east to road end. MD 32AI: (no name) (AA) 0.04 mi. ; from MD 32AF east to road end. MD 32AJ: Jackson Grove Rd. (AA) 0.27 mi. ; from MD 170 west to end of state maintenance. MD 32AK: Redmiles La. (AA) 0.34 mi. ; from Old Mill Rd. south to road end. 20.7 19 Great Star Dr.
23.17 mi. ; from Washington St. in Easton west to Black Walnut Point Rd. on Tilghman Island. Was MD 17 until 1940 when it swapped numbers with 33.
old number for current MD 17. No longer assigned, became MD 17 in 1940. Don't know why 17 and 33 were swapped, other than perhaps a proposal to extend US 17 north of adjacent Virginia, but still unsure. US 33 runs east-west a ways down in Virginia, too. 9.95 mi. ; from Alt. US 40 in Boonsboro west to Potomac River (WV line) adjacent to Shepherdstown, WV. MD 34A: North Main St. 0.12 mi. ; connector at north end of Keedysville. MD 35 · Ellerslie Rd. 2.37 mi. ; from MD 36 in Corriganville north to PA line in Ellerslie. 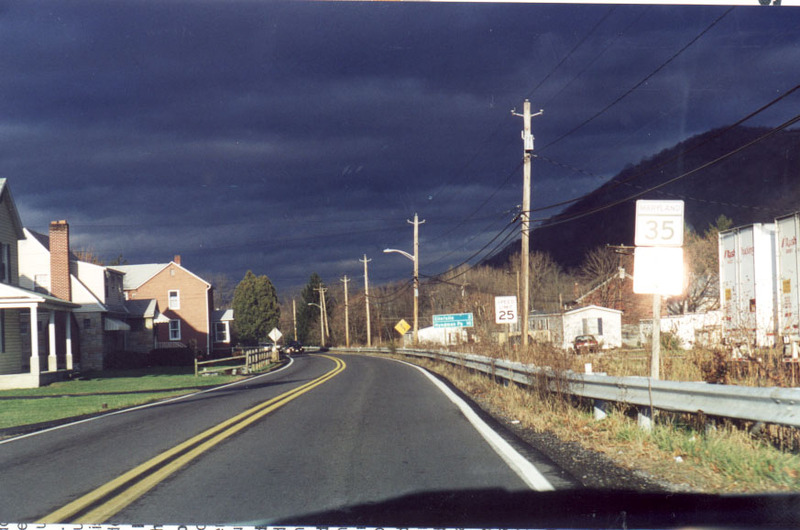 MD 35 heading north, ominous clouds ahead (photo 1999). Sometime between 1939 and 1946, MD 35 was truncated to its current length, having once extended south down current MD 36 to US 40 Alt (Back then, it was the main US 40). Becomes PA 96 at the border just past Ellerslie. 29.43 mi. ; from WV Line in Westernport northeast to Alt. US 40 northwest of Cumberland. The part of MD 36 south of I-68 runs up the narrow George's Creek valley. The creek, MD 36 and a rail line twist about each other almost like a helix. There are several rail crossings at-grade on 36, plus a few old alignments to make things interesting. The old main street of Westernport has been bypassed (old now MD 937 unmarked). Barton, Moscow and Pekin (which the Post Office calls Nikep) have all been bypassed (old route is unmarked MD 935). That leaves Lonaconing as the only un-bypassed town along the route. MD 36 originally went to Frostburg along what is now (marked) MD 956, then was shifted to the east along a part of MD 55, meeting up with Alt US 40 east of Frostburg, running concurrently with Alt 40 through most of that town. Running northeast from Frostburg, the route becomes narrow and confusing; if you're not careful, you could end up at a hospital entrance. Several tight curves and a one-lane railroad underpass characterize MD 36 between Frostburg and MD 47, passing through historic Mt Savage, looking much as it did in the late 1800s. Only upon reaching MD 47 do things open up with wide lanes and shoulders like further south. MD 36 then loops back with Alt US 40 northeast of Cumberland. At the 'northern' terminus with Alt 40, the directional banner is done away with. Geographically in a north-northwesterly direction, but it would read 'south' in terms of the route. Prior to a WWII-era number swap, MD 36 once ended at MD 35, and the latter ran south to Alt US 40. The last map to show MD 35 was 1938, with 1939-40 versions showing no marker specifically along that portion. Only with the first postwar version in 1946 is it shown as MD 36. MD 37 · was McDonough Rd. 0.65 mi. ; near I-795 overpass, Owings Mills. On some maps since the fifties. Didn't touch any other route, except the bridge over I-795. Most strange. MD 37 marker at beginning of route, eastern terminus near Owings Mills, 1998.
old number for US 219 south of US 40. Status: No longer assigned, entire route now part of US 219. In the thirties, US 219 ended at US 40 in Grantsville. Circa 1939 it was decided to extend 219 south through Garrett Co. into West Virginia. Soon thereafter 37 was reassigned to the short piece of McDonough Rd above. Route 37 marked the end of the east to west statewide 12-37 numbering cluster. MD 38, 39, and (41) were assigned to local routes in Garrett County., beginning the second tier of routes ending at 380 on the lower Eastern Shore. MD 38 · Kitzmiller Rd. Once went further west along 135 then north on Sand Flat Rd. to US 219. Begins Garrett County 38-42 primary numbering cluster. Sections of MD 38: both connect 38 and 135. MD 38A: (no name) 0.0 mi. ; east of 38. MD 38B: (no name) 0.0 mi. ; west of 38. MD 39 · Hutton-Oakland Rd. 6.22 mi. ; from US 219 in Oakland west to WV line. The westernmost Maryland state route, reaching west longitude 79° 29' at the West Virginia border. Becomes WV 7 when it gets there. MD 39A: (no name)0.01 mi. ; north off MD 39 to MD 827C.